We are into the 4th week of "How I stretch My Stamps"! If you miss the previous serious, just click on the links under the blog banner and it will take you to all the series. Do all the stamped images have to look just the way they are supposed to? Not really. Here is one of my favorite stamps. 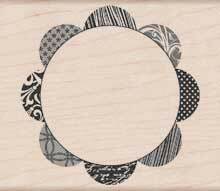 I used it as a tree stamp and I used it as part of the "frame". Unless you know about this stamp, otherwise, you would not have suspected that it is actually a tree stamp, would you!? It can be anything you want it to be. Here I turned it into an umbrella! Edited: Please mention in your post that you are linking it to "How I Stretch My Stamps" and feel free to use the text bird logo. These examples are fantastic! How you come up with your ideas like that frame flourish from the tree is amazing. Thanks for all the inspiration, I'm loving your series!! It also helps to have your genius for seeing the possibilities of using the stamps in different ways! You're amazing. Thanks again for doing this great series!! Wow! These ideas are brilliant and the cards are lovely! You just blew my mind how you turned that tree into a fancy frame! Amazing inspiration! Wow! Wow! Wow! Love all your cards (yet again) :) especially how you created the frame on the second one. Great cards, Virginia! I especially love that gorgeous umbrella. Thanks for giving us a great series. Great "stretch your stamps" ideas!! What you did with just these two stamps ... AWESOME!! It makes me think and learn! Thanks for all your nice comments on my blog!! = great motivation!! I'm really loving this series too, Virginia! I'm coming to think that there are a lot more possibilities with some of my tired old stamps...hopefully I'll bring them out to play today! These are all perfect examples of why I admire your work Virginia! You always use stamps in the most creative ways! Thank you for another great lesson, Virginia. Your creativity is amazing. And thanks so much for visiting my blog and leaving comments. I appreciate that immensely! Your frame is genius, what a great idea! You are sooo thinking outside the box! Can't believe the versatility you have demonstrated. Makes my brain spin.....what a way to start a Sunday. Thanks so much, Virginia! Amazing examples of how to stretch your stamps, Virginia! How could I have missed so many posts from you!!?????? I am behind 25 posts! I loooove how you used that tree stamp as a frame!! FUN and clever:) YOU ROCK, Virginia:) HUGS! you are just too clever! I kept having to re-look at the stamps to see how you had done this-gosh not sure I could manage to think quite so 'out of the box' Just fab!! Love today's cards, I think my favorite is how you used the tree as kind of brackets to frame the opening. So clever! Oh, Virginia! I DO remember that scallop circle stamp and the clever ways you used it! Even back then you stretched your stamps so creatively! Today, the possibilities are endless with your uber talented brain! it's always a treat visiting your blog! Wow..wow...WOWZERS! LOVE all of these! Amazing, so many beautiful cards in one post! I love the umbrella one, so cute! I just love these post. You are so creative and have so many great ideas. Thanks for sharing them with us. You're an endless source of ideas! When you pick up a stamp, do you have to stare at it for a looonnngg time before you come up with something clever? Or do ideas just jump out of you??? Brilliant! It's posts like this that really get me inspired. Thanks Virginia! Virginia, since you do a lot of stamping...just wondering...what do you use to clean your stamps? you are a genius, girl! clever use of those stamps. love love them all!